They don’t work with pagination. 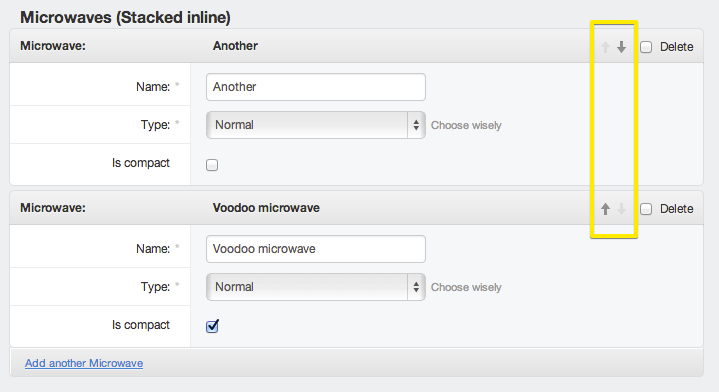 You won’t be able to use different list order other than by sortable parameter. That’s it, you should see similar picture to example below in your admin now. If you want sortable arrows to appear in different column than last, you can do this by adding sortable field to list_editable in desired order, for example: list_editable=('name', 'order', 'something'). If you set arrows as first column, you must also define list_display_links - because arrows can’t be displayed also as links. MPTTModelAdmin must be specified “before” SortableModelAdmin in extend syntax as shown in example.